Marietta, the oldest, permanent settlement in the Northwest Territory is located where the Ohio and Muskingum Rivers meet. Established in 1788, the area is steeped in history, but also has a growing arts and music scene. 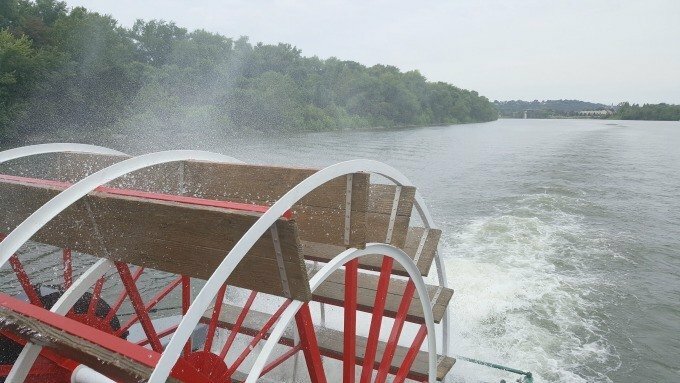 I couldn’t wait to learn all about Marietta, from the Sternwheelers I remembered from visits to the area as a child, to Indian Mounds, to historic homes and properties. 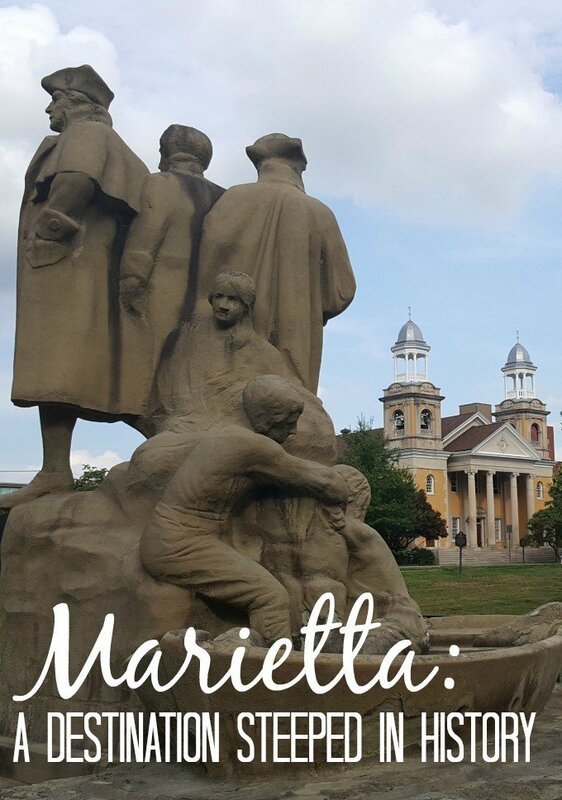 Marietta is exactly the type of destination that my husband and I love to explore. Our stay began by checking in to the historic Lafayette Hotel in the downtown historic district. The property, built in 1918 is directly across the street from the Ohio River. Walking into the property, you feel as though you’ve stepped back to the Showboat era. The décor in the lobby and public areas feature memorabilia of the bygone days while the rooms are decorated in Victorian or showboat themes. I was thrilled when we exited the elevator on the fourth floor and entered our air conditioned corner room to find beautiful period furnishings that included a heavy four poster bed with steps, Wing chairs, a writing desk and armoire. Painted glass shade lamps graced the end tables that flanked the bed on each side and the large tiled bathroom was bright and spotless. Our stay was off to an amazing start. We spent a few minutes settling in before heading out to meet my brother, sister-in-law and nephew for an ice cream cone at Neader’s Cone and Shake ice cream stand on Pike Street, a two-minute drive from the hotel. The Cone and Shake has ample of parking and while they don’t have indoor seating, you’ll find plenty of covered picnic table seating outdoors. We talked for about an hour before my 5-year old nephew had enough and wanted to know what we were going to do next. 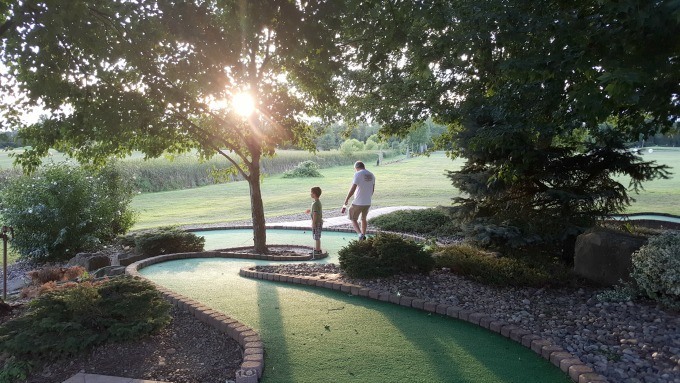 He’s obsessed with putt putt golf so he convinced his mom and dad to take us to one of his favorite places, the Pioneer Golf Center. After the game was over, he insisted we go to the park to play. On the way, we drove through the historic area, got a glimpse of the Mound Cemetery and stopped to play at a park beside the library. A sucker for Carnegie libraries, the Marietta Public Library caught my attention for another reason as well. Opened in 1918, the building is the only library in the United States built on top of an Indian mound. Mounds and earthworks built by the Hopewell people are plentiful in Marietta and while I had hoped to take the self-guided walking tour of the mounds, my husband was not as interested as I was. I’ll save that tour for another trip to the city. Before our arrival, I printed several walking tours from www.mariettaohio.org. 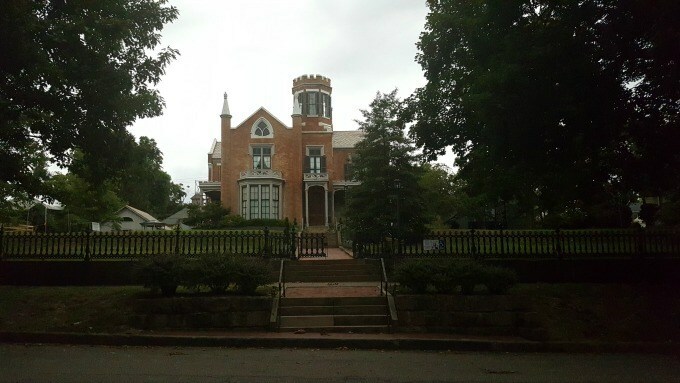 The Marietta Historic Homes Walking Tour highlights some of the key properties in the historic district and is a great tour for those interested in history or architecture. Visitors can stop in to The Castle, a large Victorian style home with adjacent carriage house, during operating hours for a guided tour of the property. The Campus Mauritius Museum shelters the Rufus Putnam House. It was built in 1788 by Marietta’s founding father and his home until his death in 1824. 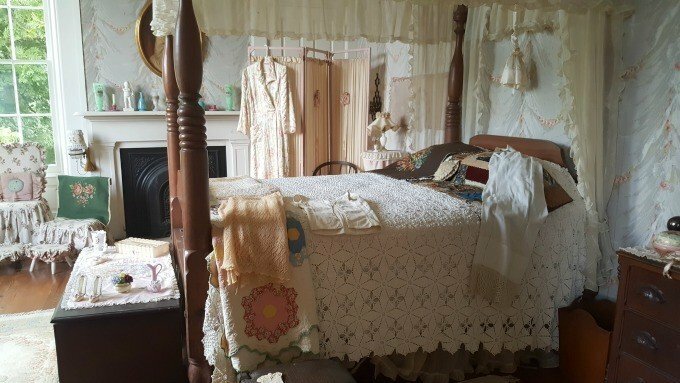 The guided home tour is available during normal museum hours. The museum brings early American history to life through hands-on, interactive exhibits, carefully curated memorabilia and experienced docents. I needed to spend much longer in the museum than I had time for. Another attraction to return to. The Marietta Historic Churches Walking tour started at the First Congregational Church, one of Marietta’s oldest churches. 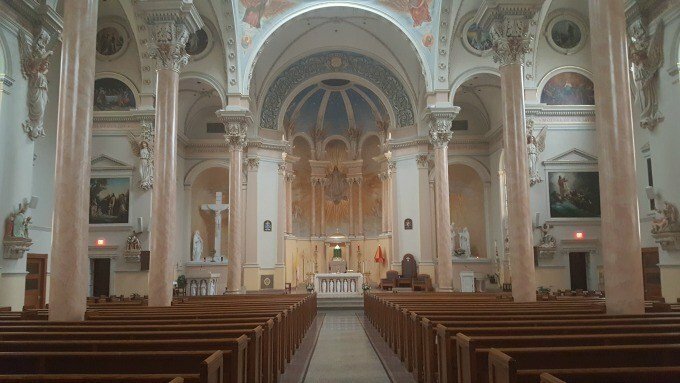 We didn’t stop to take a peek inside this building, but we did stop to tour St. Mary’s Catholic Church, or the Basilica of St. Mary the Assumption. Built in the early 1900’s and opened in 1909, this exquisite property with carved wood motifs, stained glass windows and ornate paintings, is a must-see. We concluded our morning with a sightseeing tour on board the Valley Gem. 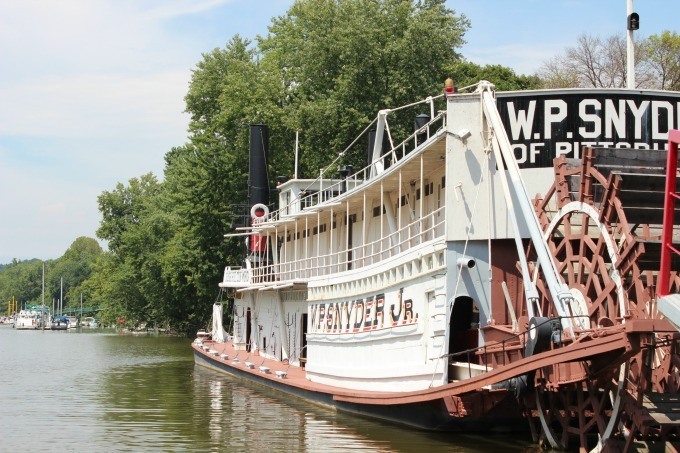 The sternwheeler carries passengers down the Muskingum River to the Ohio River for a leisurely 90-minute sightseeing excursion. Only the first 30-minutes feature the sightseeing portion, after that you basically sit back and enjoy the view- or fall asleep- as my husband did. We also took the opportunity to have lunch on board in the Portside Café. My husband opted for a hot dog while I got a chicken sandwich and fries to share. The Valley Gem is located beside the Ohio River Museum. Visitors can stroll the grounds and three buildings that make up the museum that highlight the Ohio River and steamboat era. 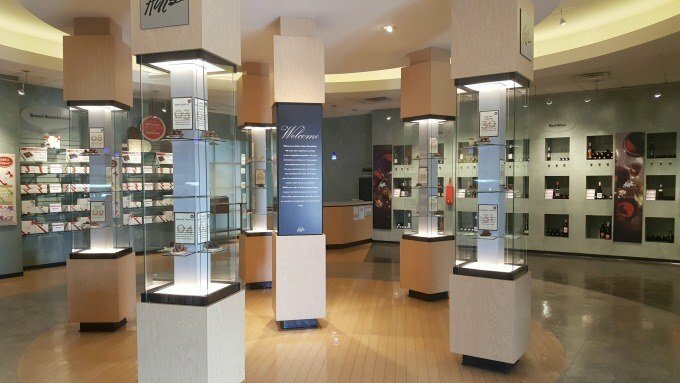 Guided tours of the W.P. Snyder Jr, a steam-powered “pool-type’ stern wheeled towboat once owned by the Carnegie Corporation and last intact vessel of its kind in the US are also available. Throughout Marietta you’ll notice historic markers and plaques that share tidbits of history about the properties located along the historic downtown and beyond. The markers are made at Sewah Studios in Marietta. 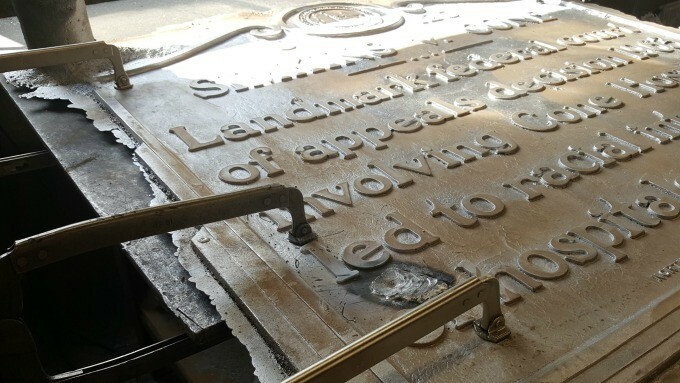 The only factory of its kind, Sewah Studios cast aluminum historical markers can be found in each of the 50 states and several foreign countries. 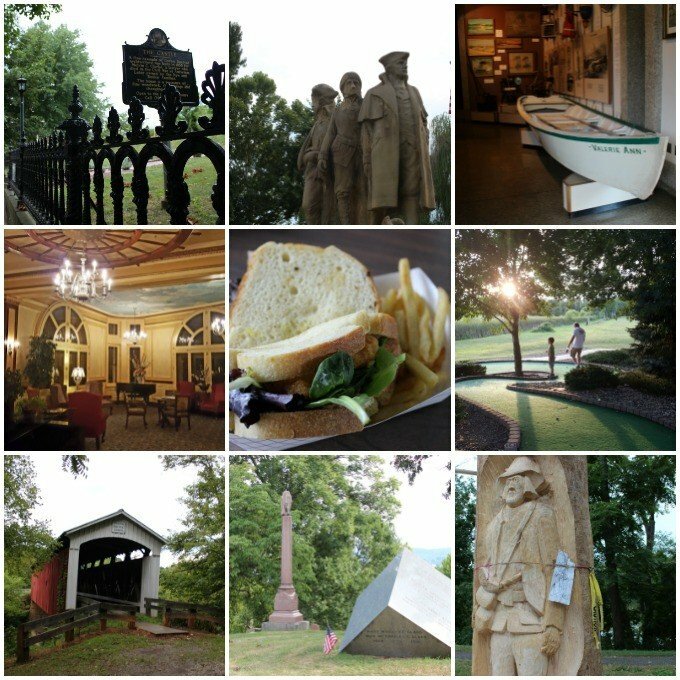 In addition to the walking tours, museums, home tours, parks, monuments, and boutiques, and shops located in Marietta, there’s also a Covered Bridge Driving Tour. 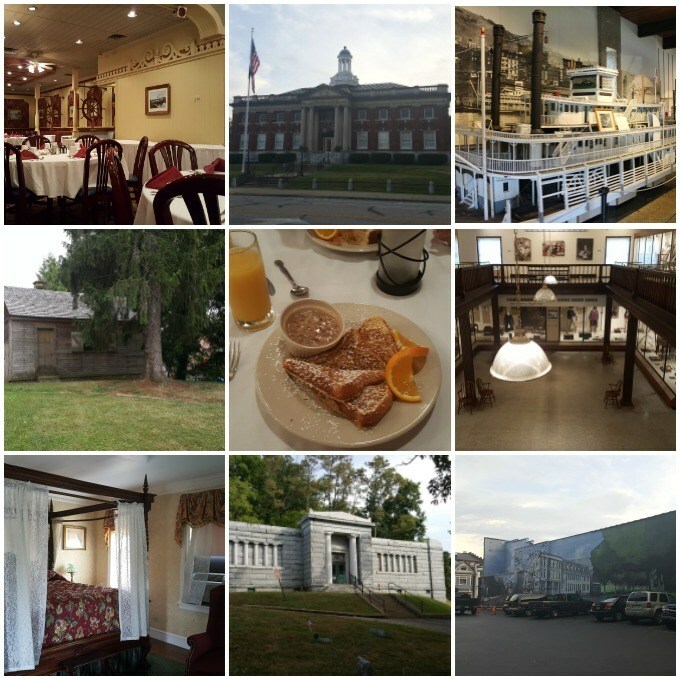 The tour lead my husband and I through the backroads of Washington County, the winding roads and hilly landscapes reminded us more of nearby West Virginia or Kentucky, then Ohio. Though there are nine covered bridges on the tour, we found only five before it began to rain and we called it quits. If you’re looking for a great place to eat, The Galley offers good food in a comfortable, casual atmosphere. Housed in the same building as The Hackett, a boutique hotel on the 3rd floor and the Adelphia Music Hall, a busy venue for up and coming bands and entertainment, the property is a great attraction for those looking for good food, cocktails and incredible music. After exploring Marietta, we headed across the Ohio River to Parkersburg, West Virginia. 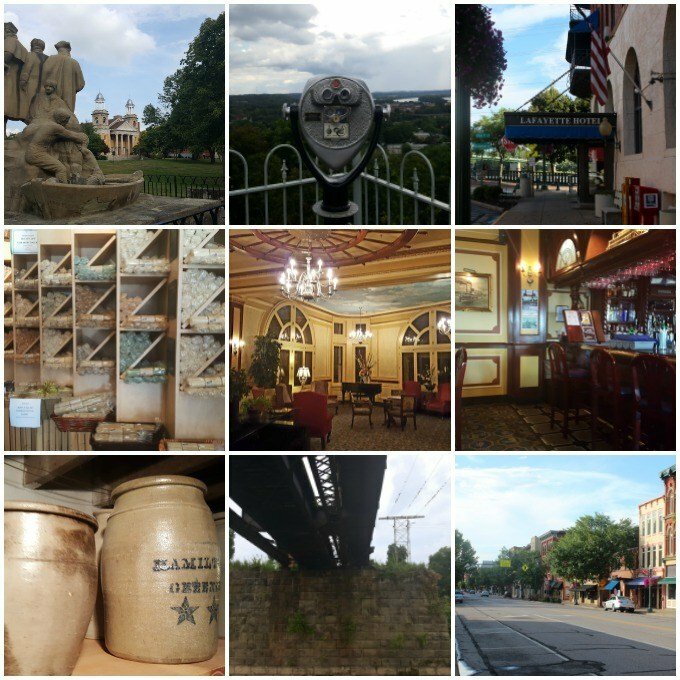 My husband had spent quite a bit of time in Parkersburg a few years ago working for a local company and we’d explored some of the city, but there were a few things we’d missed. Our first stop in Parkersburg was to Henderson Hall. This property is unique because it belonged to the same family for five generations and they saved everything. Today you can tour the property and see furnishings original to the home. The grounds include a carriage house and other outbuildings, including one where the servants would have slept. Our next stop was to Holl’s Chocolates, a family owned business which specializes in Swiss chocolates. 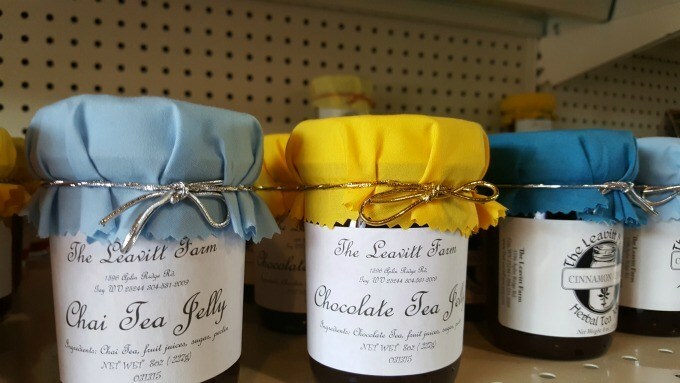 Everyone who enters the store receives one free sample. I tried the Sea Salt Caramel and have to say if I lived near Vienna, I’d be tempted to stop in daily for that nugget. Along the river you’ll find Point Park. Located behind the flood gates, this park is a popular venue for concerts and special events. It also offers an amazing view of the Ohio River. Point Park Marketplace is located right before you drive through the gates and offer baked goods, custard, West Virginia wine, specialty items, and produce from local farmers. On Friday evenings, you’ll find live entertainment from 5:00 p.m. to 7:00 p.m.
You can read more about things to do in Parkersburg in this post, Road Trip to Parkersburg: 10 Places to Visit in this West Virginia Town. Stay tuned as I share more about my trip to Marietta and Parkersburg. If you have the time, you’ll definitely want to stay more than a day. Find great rates on area hotels and properties with Hotels.com: Download the free Hotels.com app and enjoy up to 50% savings with Secret Prices! 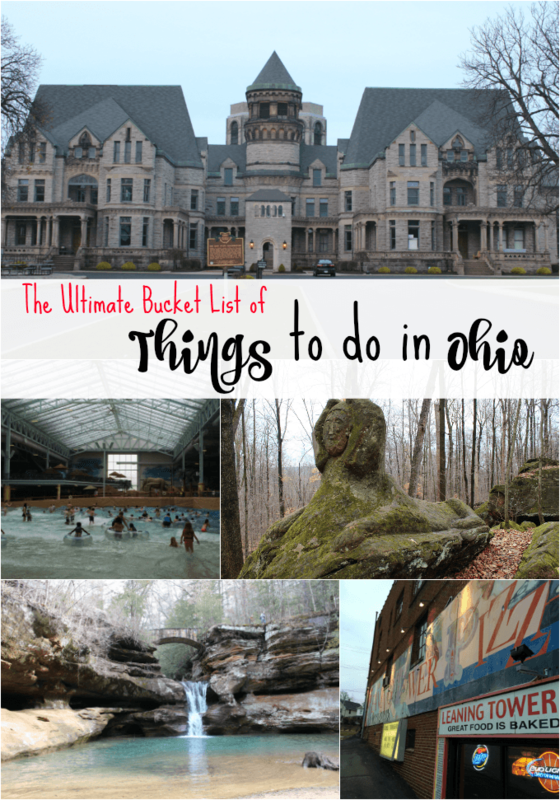 Don’t forget, if you’re looking for something to do in Ohio, check out my suggestions in this post. Just click on the photo to visit the page. Thank you to Marietta CVB for hosting my stay. Great article with lots of detail. We had to drive quickly through Ohio on our last drive through, but your article makes me want to stop and savor the delicacies! Nicely written, Tonya. I grew up in Marietta, and you allowed me to travel with you to re-live some childhood memories. I love historical destinations like this and the Lafayette Hotel sounds like it’s the perfect complement to a trip. I am sooo jealous right now! I’ve always wanted to go on a steam boat. It looks like you had a fabulous time in Ohio and I am really surprised with all the cool things to do there! Now I’m really craving Swiss chocolate! Looks like a fun place to explore. ‘d never heard of Marietta before reading this, let alone that it was the first permanent settlement in the Northwest Territory! Sounds like an interesting place! 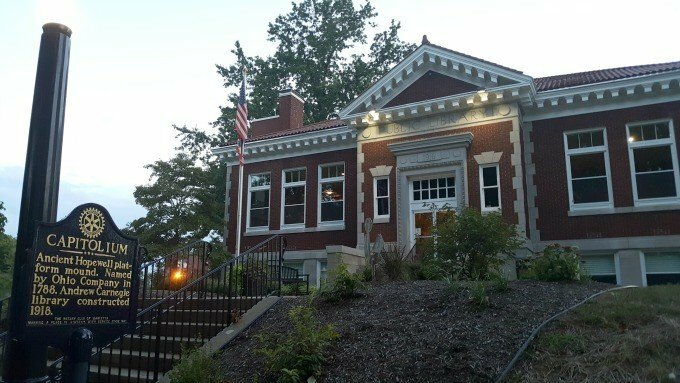 I’m a sucker for Carnegie libraries, and libraries in general, too! Shame your companion wasn’t as in to it as you were…as you say, next time!